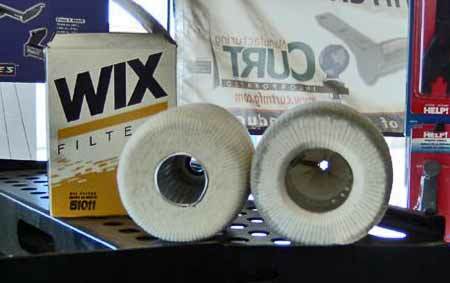 "Cartridge Lube Sock Filter" is not exactly a household term — even in the homes of vintage vehicle restorers. 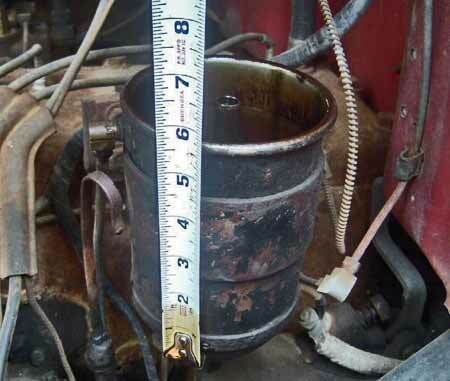 However, you might be familiar with this type of canister style oil filter if you own a 1946-1960 Dodge truck, a Clark forklift, a Flxible bus or a machine or truck with a Hercules, Hyster or IH engine. These vehicles represent the principle applications for the Wix 51011 or NAPA 1011 oil filters. Since we were working on a 1953 Dodge B4 pickup that had been in dry storage for around 40 years, it seemed like a good idea to change the oil filter before attempting an initial start up of the engine. 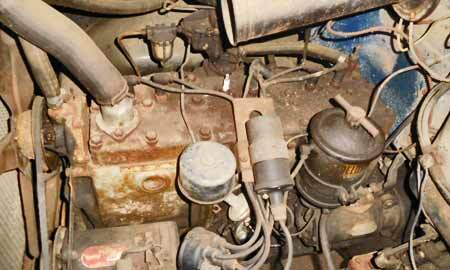 The original oil filter canister was still mounted on the driver's side of the six-cylinder Dodge flathead engine, just above the starter motor. It was hanging in a bracket attached to the block. There was even a handle of sorts on top of the removable lid. Turning the handle counter-clockwise releases the lid so it can be removed, along with a gasket, to take out the oil filter element inside. "One ugly sock" is about the only way to describe the dirty black filter that was stuffed into the canister on this '53 Dodge. The once-white, sock-like material was covered with grease and soaked in oil that was four decades old. As you can imagine, it was not a pretty sight. It looked like a rotted beehive with pockmarks on the top along with a wire bale to lift it out of the canister. It also looked a little shorter than a new No. 1011 NAPA filter. Was there a problem? The filter canister was also a bit rusty looking, but we could see the word "Deluxe" showing through the coat of surface rust. By using some WD-40 and a rag, we were able to get rid of more and more rust and see even more of the writing on the canister. It read, "MOPAR OIL DELUXE FILTER JC Series. Deluxe Products Corp., La Porte, Ind." The number 1265706 could be read near the end that faced the truck's firewall. On the front end was the Patent No. 2168124. 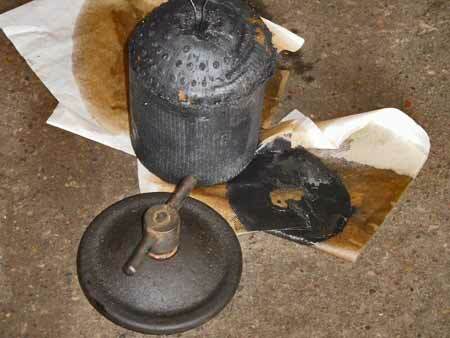 The greasy and oily old filter was placed on the ground near the removed lid and the remnants of the old gasket. 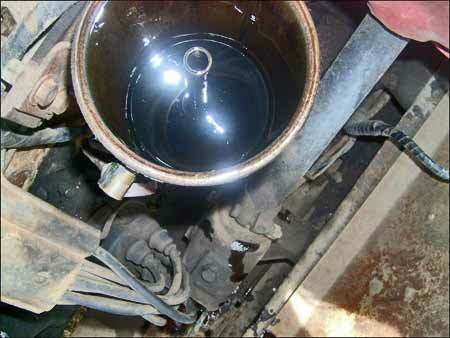 Everything was pretty cruddy and the sock-like material was totally impregnated with old oil. (John Gunnell photo). This wording and the numbers didn't mean anything to the man at the parts counter in the local NAPA store. However, he was able to specify and order the NAPA No. 1011 filter. It had a suggested retail price of $18.90. Getting the filter was just a matter of paying for it, but trying to fit it into the canister was a lot harder job. We pushed it pretty far down into the canister, but there was still over a half inch of filter showing above the rim and it wasn't going to go in any further. This photo shows the basic design of the Wix 51011/NAPA 1011 filters in both end view and side view. 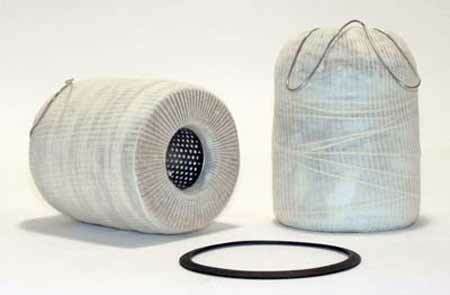 During a parts consolidation effort, a slightly taller and wider sock filter was released that is difficult or impossible to install. According to the NAPA Website, the No. 1011 filter has the following specifications and dimensions, which are also the same for a Wix 51011 filter. Apparently, the two are the same except for the brand name on the packaging. Filter I.D. (Inches) .563 in. Filter O.D. (Inches) 4.063 in. Gasket I.D. (Inches) 3.985 in. Gasket O.D. (Inches) 4.515 in. 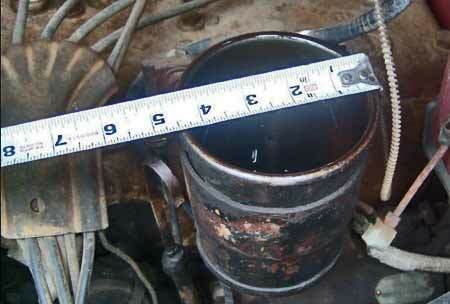 Gasket Thickness (Inches) .062 in. 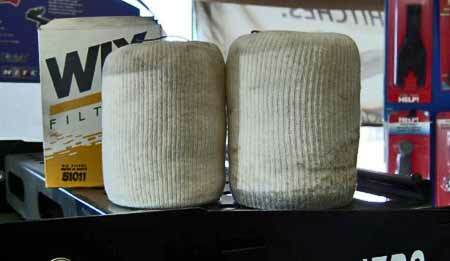 A problem arises in that the Wix and NAPA filters are slightly larger than the original-style Mopar JC series filter. This shows up clearly in the specifications and dimensions for a third oil filter that's available — the Baldwin JC405. Note that the JC prefix is the same one used on the original Mopar part. Specifications for the Wix 51011/NAPA 1011 filters show an outside filter diameter of 4.063 inches, while the Baldwin JC405 lists an even 4.00 inch diameter. Todd Wilson took this photo showing a 4.50 inch canister opening. This suggests that all the filters fit as far as outside diameter goes. Specifications for the Wix 51011/NAPA 1011 filters show a height of 5.562 inches while the Baldwin JC405 calls this the length measurement and shows it to be 5.25 inches. Todd Wilson took this photo showing an approximate 5.75 inch high canister opening. However, the taller filters are a tight or impossible fit so the shape of the canister opening must be a factor as well. 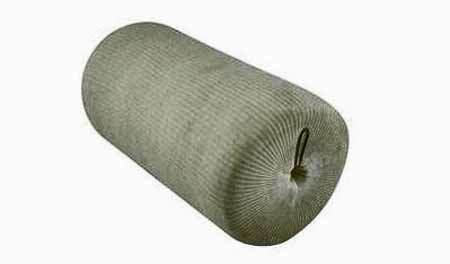 The Baldwin JC405 is described on Vintage Mopar Parts as a "Cotton and Fiber Media By-Pass Lube Sock Element Filter with Pull-out Bail Handle for Dodge Trucks '40s-'50s." That Website notes that the Baldwin JC405 "replaces and is the same as Wix 51011 or NAPA 1011, however it fits your oil canister much better. It is listed as a replacement for a Chrysler 1504092 filter." The Baldwin JC405 filter listing shows the following three dimensions. As compared to similar dimensions in the accompanying Wix 51011/NAPA 1011 Specifications Chart, the Baldwin JC405 is a smaller and shorter filter. Dodge truck enthusiast Todd Wilson found that out several years ago: Wix combined two filters into one to come up with the Wix 51011/ NAPA1011 design. "Some say that the filter is too big, but others say you can cram it into the housing although others can't," wrote Wilson. "I have had no luck doing this." 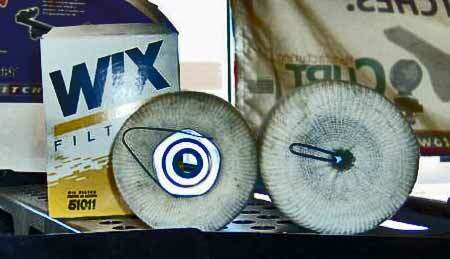 In this comparison photo that Todd Wilson took you can clearly see the height difference between the two types of Wix 51011/NAPA 1011 sock filters. Wix engineers confirmed the issue, but there was no recall of the taller filters. This Baldwin JC405 shown here replaces and is the almost the same as the Wix 51011 or NAPA 1011, however it fits the oil canister used on Dodge trucks much better. It is listed as a replacement for a Chrysler 1504092 filter. In addition to the size problem, enthusiasts should be aware that the Wix/NAPA oil filters are sold online at various retail prices from approximately $19 all the way up to $29 or so. However, an outfit called Fleet Filter sells them for as little as eight dollars and change if you buy them by the dozen. 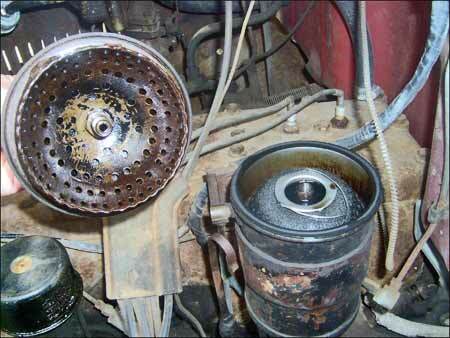 Fleet Filter also sells Baldwin oil filters, but the JC405 does not come up on their Website.